My day started with Jillian making green cream of wheat and me rushing out to Mid-America Labs to have Seth’s blood drawn once again. The last time, the important” stuff came back normal but his lymphocyte count was up. Just a small thing, really. A brief Google search resulted with scary words like “cancer” popping up so I quickly closed the window. I went through freak out phase with his earlier issues that turned out to be non-issues. (See earlier posts…after I transfer them here.) Before I left, I told Ben to tell Lenae to take The Big Blue (our 15 passenger) and that I’d meet them at the shop. He told Lenae but somehow the message was missed plus Lenae’s alarm didn’t go off so my “staff” was still home when I returned. The soup was not heating up in the kettle and Reubens were not warming in the oven. That was fine, we were still okay on time so I didn’t spaz. That could have been the start of a bad day but the sun was shining; it was all good. Add to the hustle and bustle of the morning, the pain in my shoulder became worse (pulled something – and I have a high threshold of pain so if I notice pain, it’s worse than I think it is) and I fought the urge to become….grumpy. So I went to the chiropractor after driving the crew home after work. I can’t tell if it helped, yet. I feel worse but that’s not abnormal so we’ll see tomorrow. All that being said, all of that craziness made the laughter of the evening’s card games a welcome release. The outlandish things that came out of the mouths of my DH and kids kept me posting on TweetDeck all evening: ‎”Okay we need a glass of water, a sharpie, and a very sharp spoon.” Natalie helping make up rules for a new card game. Craig’s card game rule: “and you can’t touch the table.” Noah: “And it’s called ‘Stomp the Wombat”(thank you, Penguins of Madagascar). Craig: “What part of don’t you understand don’t you understand?” Whacked. They’re all whacked. We don’t need TV. We’re our own sitcom. 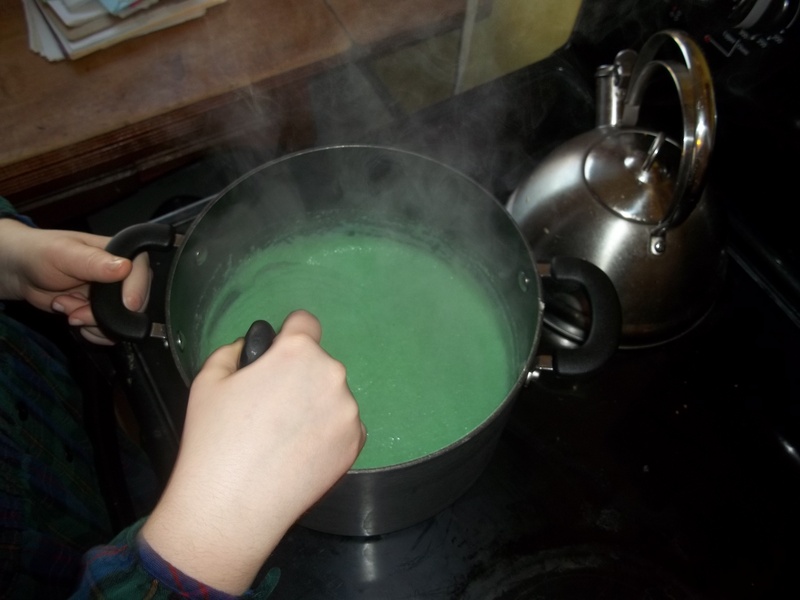 St. Patrick's Day Cream of Wheat. Ew. The kids loved it! 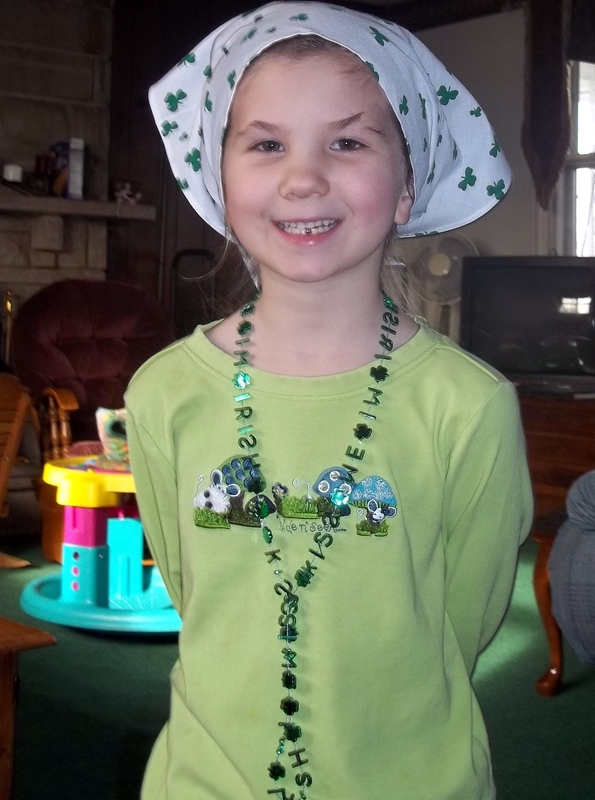 Posted on March 17, 2011, in Zookeeper & the F-Troop and tagged Family, Fun, Holidays, Humor, Memories, St. Patrick's Day. Bookmark the permalink. Leave a comment.